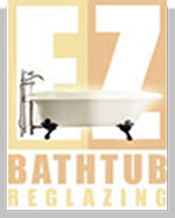 When EZ Bathtub Reglazing of San Jose, California, restores your old bathtub, you know you are getting nothing but the best. We take no shortcuts and do the job right, getting it all done in one day with no mess. We also offer a five-year warranty on our work. We strip out the old caulk form around the tub and recaulk it at th end. We bring in our powerful negative ventilation system and chemically clean and lightly sand the tub. We will remove the drain cover at costumer request, we cant put it back. We acid etch the tub, removing the old shine, leaving it dull and ready to prime. This step is key! We repair most chips 100% free using a special patching compound. We sand and blend the patched areas and sterilize the entire tub. We painstakingly mask off the area surrounding the tub including the floor. We set-up our hot turbine air compressor and remote air supply. We mix our three-part chemical epoxy primer. We spray two to three coats of primer it depend on how the technician sprays and allow it to dry. We tac-cloth and smooth the surface. We mix our two part top coat consisting of a catalyst and resin, let it induct, and prepare to spray the top coat. We spray the tub giving with six or more coats leaving you with amazing results. We clean up and remove the masking and pack up our equipment. We caulk the tub and put back any hardware that was removed. The end result is a highly chemical resistant surface with an amazing 98% gloss factor. The final product is difficult to distinguish from a new tub and is ready to use the next day. See our before and after pictures for real in home examples of our work. Our tile reglazing process is very much like the process described above. Feel free to call for more information. Due to the nonporous surface of the finish, there is no need to use abrasive cleansers. Any household liquid detergent will give excellent results. To remove mineral stains use a mild acid solution such as liquid toilet bowl cleaner. With proper cleaning and bathtub maintenance you will have a long lasting shine.